Mexican attitudes toward the United States have grown much more positive over the last year. 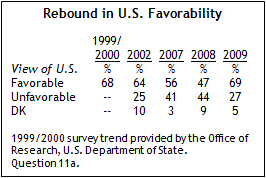 In the current survey, 69% of Mexicans express a favorable view of the U.S., compared with 47% in 2008. Positive opinions of the U.S. are now as prevalent as they were at the beginning of this decade. Mexicans are now also much more likely to think of the U.S. as a partner of their country. Last year, slightly less than half (48%) considered the U.S. a partner, while 64% feel this way now. Overall, most see the deep economic ties between Mexico and the United States in a positive light. Still, as Mexicans, like many others around the world, struggle with an economic downturn, most believe the U.S. economy is currently having a negative impact on their country. Among the 24 publics (excluding the U.S.) included in the 2009 Pew Global Attitudes survey, Mexican views toward the U.S. are among the most positive. Only six countries – Kenya, Nigeria, South Korea, India, France and Israel – give the U.S. higher marks. And among the three Latin American nations surveyed, Mexicans give the U.S. its highest rating. While 69% of Mexicans express a favorable view, 61% do so in Brazil, and just 38% do so in Argentina, where negative opinions of the U.S. have been pervasive in the past (although even in Argentina, America’s image has improved since 2008). 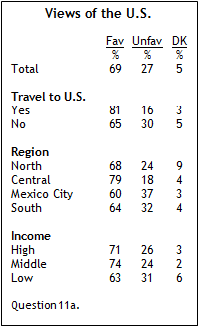 Positive views toward the U.S. are common across all segments of the Mexican population analyzed in the survey, although they are especially common among people who have traveled to the U.S. (81% favorable). Looking at the country’s four major regions, favorable opinions are especially pervasive in the central region (79%) and somewhat less common in Mexico City (60%). Also, lower income respondents (63%) express slightly less positive views than do middle (74%) and high (71%) income respondents. An overwhelming majority (79%) of those surveyed think the U.S. has a great deal or a fair amount of influence in Mexico, basically unchanged from last year when 81% expressed this view. Among those who think the U.S. is having an influence, about half consider it a negative one: 49% say the U.S. is having a bad impact. As with America’s overall image, views of the American people also have improved over the past year: 57% now express a favorable view of Americans, up from 44% in 2008. Among the three Latin American nations surveyed, however, Mexicans do not give the American people their highest rating – at 62%, Brazilians are slightly more likely to offer a positive view (compared with just 38% of Argentines). Mexico is one of the few countries included in the 2009 survey where the U.S. as a country receives more positive marks than its people. Mexicans are divided over the extent to which the U.S. takes into account their interests when making foreign policy. About half (48%) believe the U.S. considers the interests of countries like Mexico a great deal or a fair amount, while about half (49%) say not too much or not at all. On this measure, there has been virtually no change since last year, when 47% said a great deal or fair amount and 49% said not too much or not at all. Economic Ties to the U.S. Roughly three-in-four (76%) Mexicans say that, all in all, the economic ties between their country and the U.S. are very or somewhat good for Mexico. Only one-in-five say these ties are very or somewhat bad. The vast majority of those surveyed think the U.S. economy has an impact on their country: 82% say what happens in the American economy affects the Mexican economy a great deal or a fair amount. Among those who believe the U.S. economy has an impact, 70% say that right now the impact is negative. More than six-in-ten Mexicans (64%) consider the U.S. a partner of their country, while just 17% say it is an enemy. 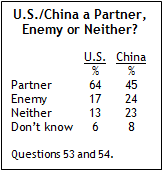 On the other hand, less than half (45%) describe China as a partner, while about one-quarter (24%) call China an enemy. Overall, Mexicans offer much more negative views of China than they do of the U.S. – 39% express a favorable view and 43% an unfavorable view of the Asian country. China receives less positive ratings in Mexico than in most of the other countries included in the 2009 poll. Only three nations – Germany (29%), Japan (26%) and Turkey (16%) – give China less favorable reviews.